40 oz double wall 18/8 stainless steel thermal bottle with copper vacuum insulation, threaded insulated lid, silicone band, lid retaining loop, and powder coated finish. Keeps liquids cold for 24 hours or hot for 12 hours. 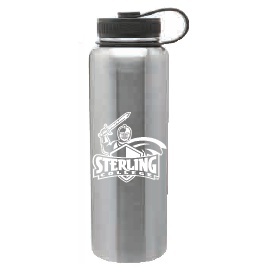 Sterling College Warrior logo in white.